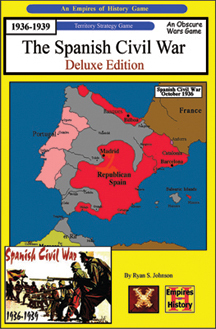 The Spanish Civil War is 2-6 player, easy to learn territorial strategy game, covering the Spanish Civil War of 1936-1939. The testing ground for the combined armor and air tactics that would later spill so much blood in WWII. Complexity: Moderate. Playing time 2-5 hours. 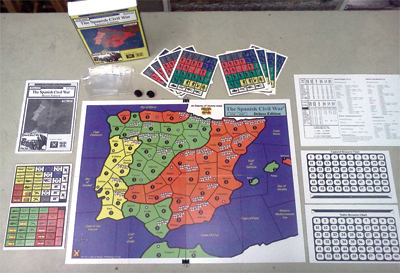 The Spanish Civil War board games provides two game scenarios. In the historical scenario the Spanish Nationalists and the German/Italian support forces face off against the Spanish Republican forces and their Soviet allies along with the volunteer brigades. The Republic begins game play with more productivity, but must face a stronger Nationalist army and hold ground against it. The second scenario allows for an alternate historical scenario. In this scenario, both Britain and France, who approved of neither the Republic or the Nationalists governments, move to support a Portuguese invasion of Iberia. This is a 3-6 player scenario pitting three unaligned forces against each other for control of both Spain and Portugal. 16 in. x 20 in. Mounted 2 piece map of Spain. 340 Color, Die-cut Game Units. Mounted Resource, Manpower & Setup Charts.